Carmen Lavanchy, member of Chile’s wildly successful children’s music group, “Mazapan” visited Saint David’s on Friday to sing and play with our Lower School boys, all of whom study Spanish as part of our Spanish immersion program. Carmen, who also recently revised the entire public school music curriculum in Chile, shared games that develop musicality and rhythm skills, as well as the Spanish language. In addition, each of our Lower School classes sang a song in Spanish for her, which she loved. The boys had a terrific time learning while playing with Carmen. A minimum of three times each week our Lower School boys are fully immersed in the Spanish language and learn about the cultures of the Spanish-speaking world. The learning of the language, especially in the early grades, incorporates playful, visual, musical and kinesthetic activities that aid in the retention of content and, as evidenced by Carmen’s visit, make learning so much fun. 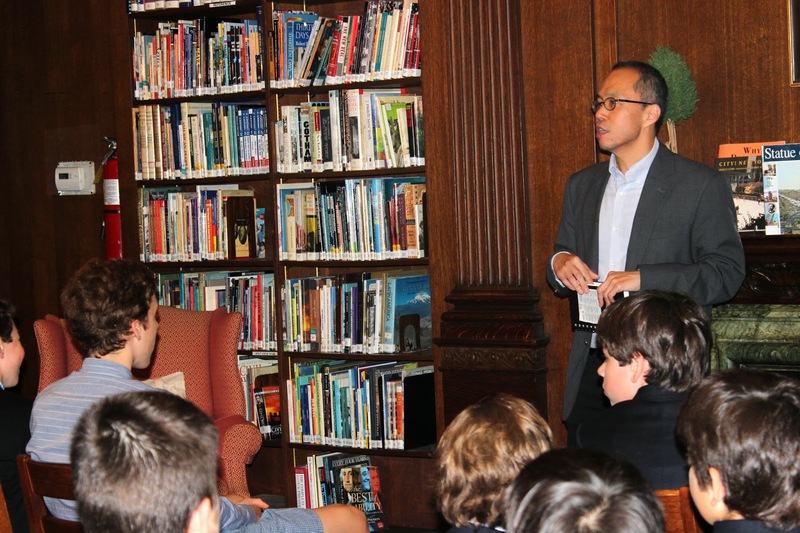 This morning, Howard Chua, former News Director for TIME magazine in Europe, spoke to our Seventh and Eighth Grade boys as part of the ongoing Authors Series. Mr. Chua’s talk focused on the process involved in selecting TIME’s Person of the Year, including a discussion of last year’s two finalists, Edward Snowden and Pope Francis. The boys’ asked several thoughtful questions including how TIME handles finalists, like Snowden, who are known more for their infamy, and whose selection might therefore result in a loss of advertising dollars. 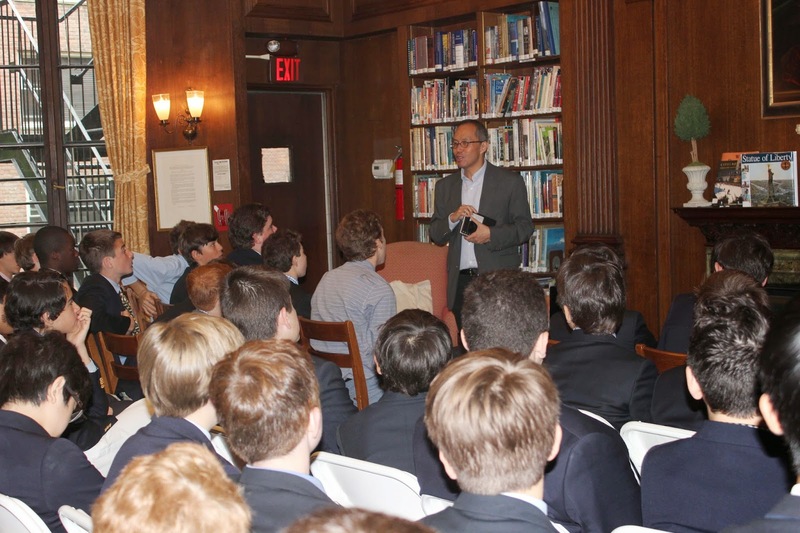 The Author Series is a wonderful PA sponsored program, which provides our boys the opportunity to engage in stimulating discussions with notable authors from a variety of publications and media outlets. Manhattan Private MS League Champs! 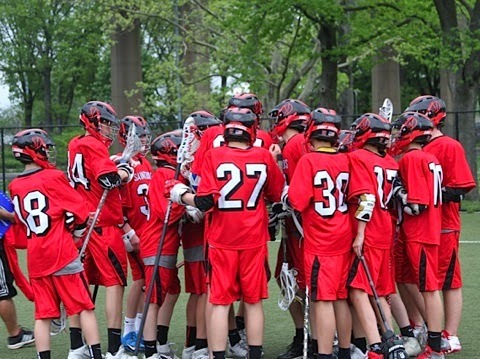 Yesterday, our Varsity Red 7th and 8th Grades lacrosse team won the MPMSL title for 2014. Clinching the title in an exciting match made this the sixth league title for Saint David's Lacrosse since the program was launched in the spring of 2000. Congratulations to all the players and to our coaches on their win and, more importantly, for always encouraging good sportsmanship on the field. Saint David's boys honor the game above all else. I spent the early morning this morning with Saint David's alums at Horace Mann. Connor S, '10 is graduating this year and heading off to Georgia Tech. He's excited and especially looking forward to orientation in Montana this summer. Andre J., '11, Christopher W., '11, William W., '11, Pedro deCG., '12, and JP C., '13 are all representing their Alma mater with distinction. The boys are involved in a variety of sports from track to lacrosse, football and soccer with many on the school's varsity teams. They are keeping up with their studies, felt very well prepared, and are excited about their summer plans: one is off to China to immerse himself in Mandarin, one to the NY Stock Exchange for an internship, another to the DR for community service, one to a soccer intensive/physics intensive, and one will travel extensively. It was a great way to start a day! The boys were incredibly generous with their time and I appreciated and enjoyed their company and candor. 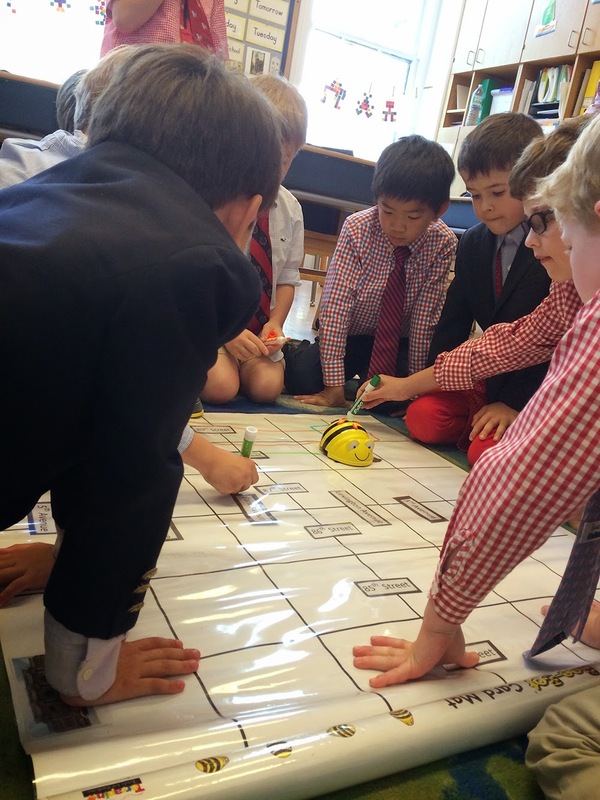 In a social studies unit that melds programming skills with mapping, our first graders are using Bee Bots to plan routes from their school to a variety of destinations. The first grade boys were first introduced to the Bee Bots this past fall in technology classes, where they learned how to program the colorful robots to move in a combination of basic directions (front, back, left, right) to a final destination. In a recent lesson, they applied their programming skills to their social studies mapping unit. This time, they were charged with devising a route for the Bee Bots that began at Saint David’s and ended at an ice cream truck parked at 84th and 3rd Avenue, using the compass rose directions of North, South, East and West. The activity involved strategizing in teams, plotting a route on paper, programming the Bee Bots, and then testing their Bee Bots in action on a grid map. Later, the boys will move on to mapping out a route from school to the Metropolitan Museum of Art, which they will actually take later in the spring. As part of this unit, they will also visit the observation deck at the Top of the Rock where they will apply their knowledge of landmarks, geography, and mapping. In this rich unit, which focuses on the landmarks and geography of New York City, we go far beyond teaching facts to our first graders. Instead, we engage them on a deeper level as we ask them to literally get down on the floor — as well as up in a skyscraper — to think critically, test actively and analyze carefully. Is a burger, promoted as such, indeed organic? How pure is chicken or seafood? What might be lurking in pond or pool water? How much DNA can be found on dollar bills? These are some of the questions our fifth grade boys are exploring in the culminating activity of their DNA unit of study with the DNA Learning Center at Cold Spring Harbor. On Monday, educators from DNALC were at Saint David’s and, with our teachers, they guided the boys in an exciting final project: The boys, working in teams, are extracting and performing DNA analysis on samples of their own choosing in order to answer a question of their own design. The multi-step step process involves extracting and amplifying the DNA, and performing electrophoresis. The samples will then be sent to a facility for decoding, and the results returned to our boys. The boys will make presentations on their experiments and results later this month. The energy in the labs today was off the charts; all of the boys excitedly offered their thoughts and hypotheses about outcomes. Equal to the energy was the degree of focus and engagement: This type of work is exacting and intricate, requiring patience and high levels of concentration. And the boys clearly love it. These were some of the assessments boys offered of this unit. 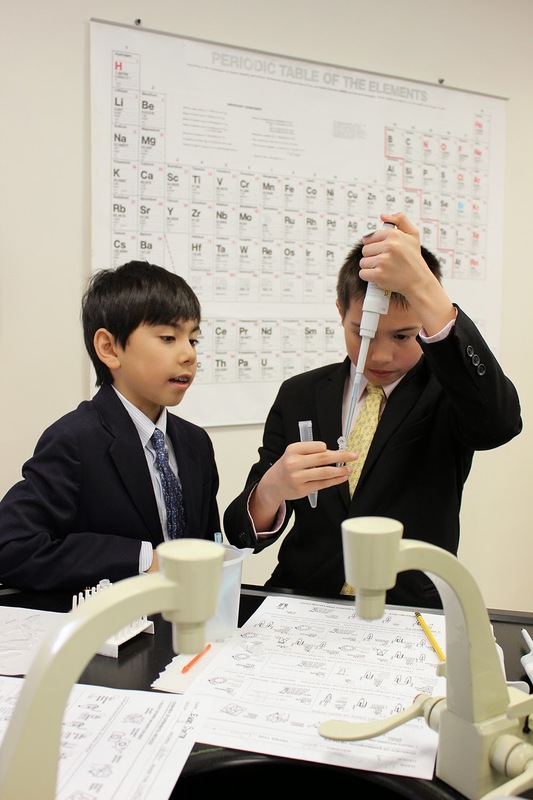 They have learned so much this year about how real-world science works, not through books or lectures, but by eagerly putting on the scientist’s “white coat and gloves” and doing the thinking and experimenting themselves. Photo 1: Sample of crabmeat to undergo DNA extraction and analysis. Photos 2 and 3: Adding silica resin to extract DNA from a sample. 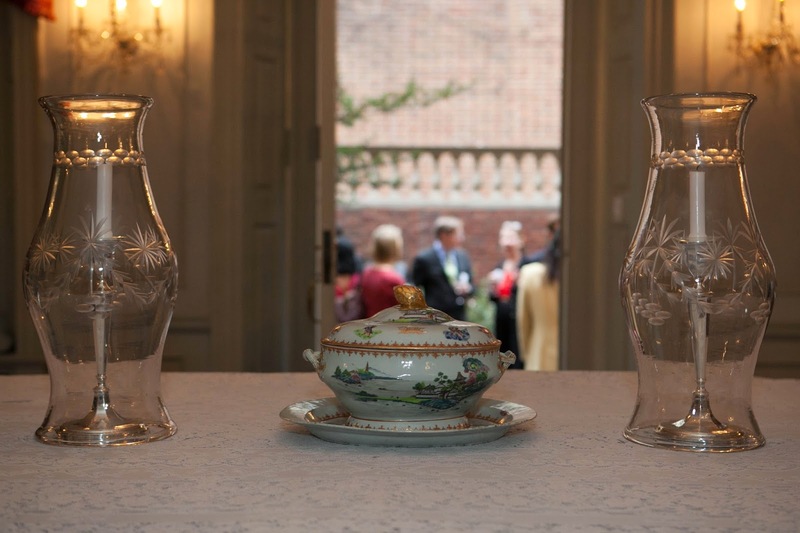 It's a place that decades of Saint David's fifth grade classes know well, where they have learned about 18th century customs, furnishings, and even how to dance a minuet--the National Society of Colonial Dames Museum House in Manhattan. Our boys visit this replica of a pre-revolutionary home of an affluent citizen in conjunction with their study of Colonial times. 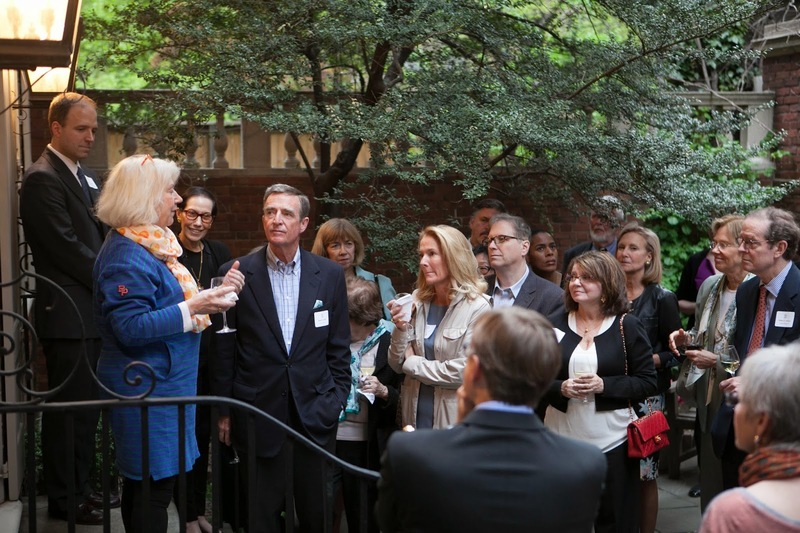 Monday evening, it was the site of our annual Alumni Parents Council Cultural Event, spearheaded by co-chairs Dorothy Faux and Linda Foran. As we gathered in the garden of this stately edifice, the museum educator Joie Anderson welcomed us and we began our tour of the house. She spoke about the Society's ultimate purpose of education and preservation. 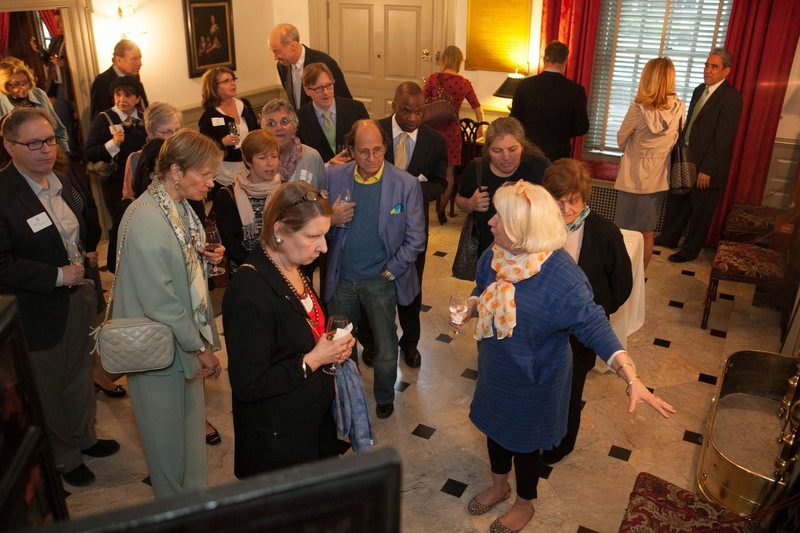 The New York Society's educational mission is focused on the vital role of the women of Colonial New York. Ms. Anderson explained that the museum house was built in 1930 by women who were descendants of important people during the Colonial era. 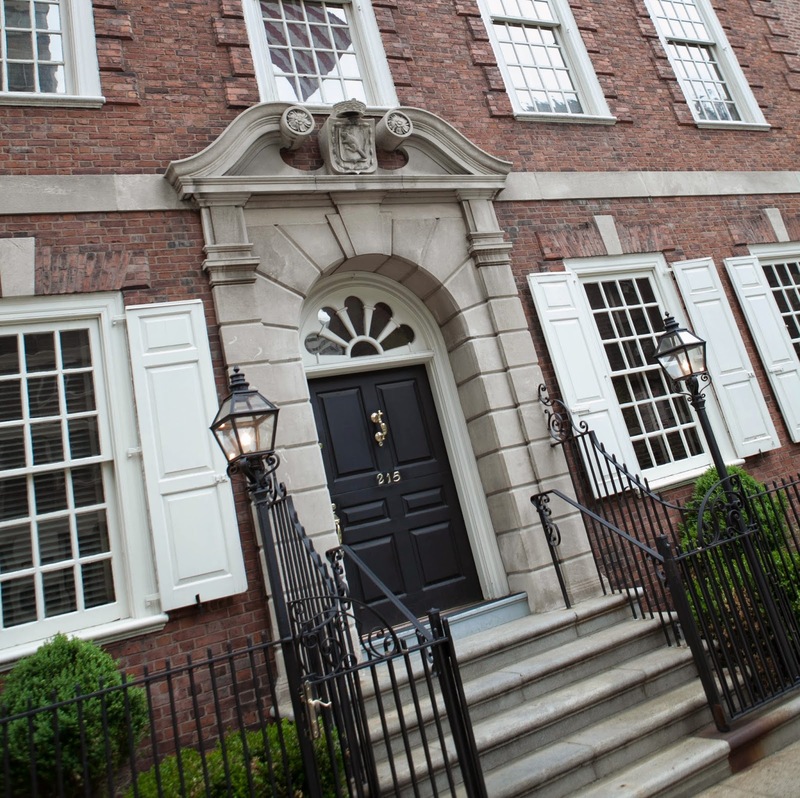 When it was constructed there were no buildings from the Colonial period of such magnitude in New York City. The museum house incorporates features from 18th century houses and is filled with 18th century furniture and artifacts. This enjoyable evening with Saint David's friends was a journey back in time made more real because we could see in each room the way a segment of people from an earlier time lived. It was decidedly low tech, not a display screen or interactive device in sight! Instead we were asked to just "be" in the past, a reminder of the value of reaching back to understand what came before us as we move forever forward. 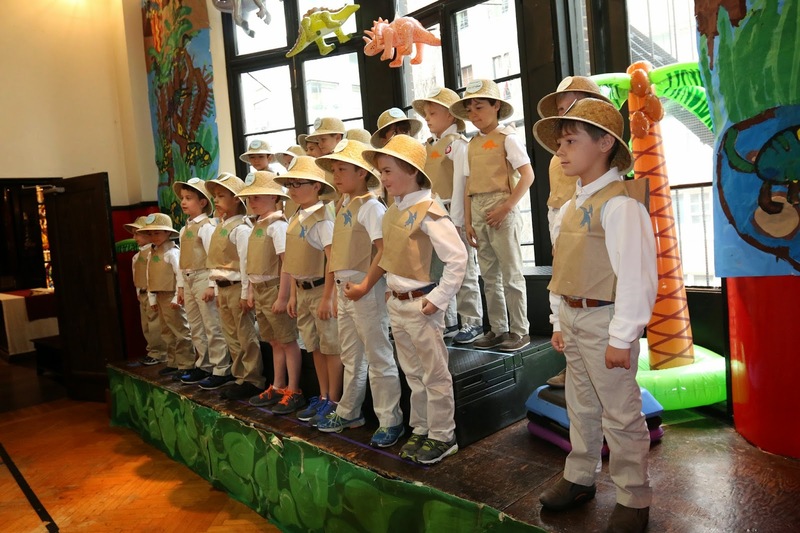 This morning, Omega boys delighted their parents and friends with a Saint David's original production 'The Dinosaur Show,' a musical showcase of all they have learned in their interdisciplinary study of the prehistoric animals. 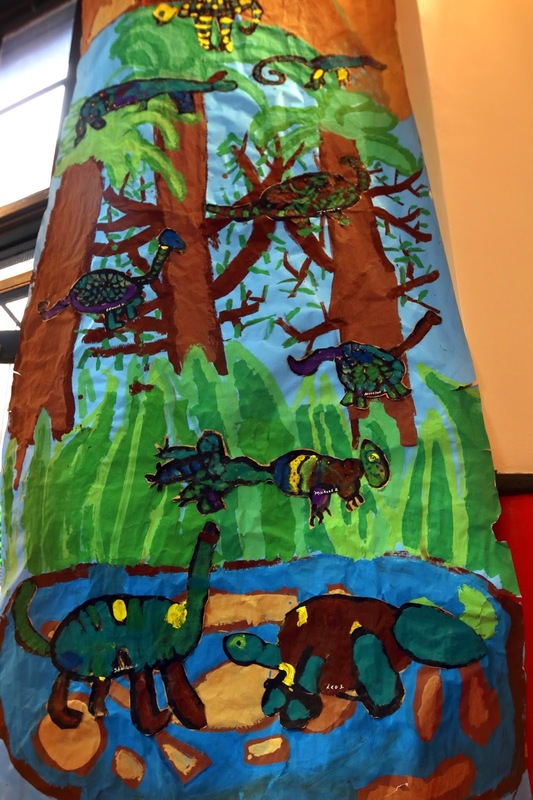 Our young paleontologists sang with confidence and flair as they demonstrated their vast knowledge of these fascinating prehistoric creatures against the backdrop of a dinosaur mural that the boys themselves created in art class. Written, scored and produced by the talented faculty of Saint David's, under the direction of Jeff Moore, The Dinosaur Show has become a highly anticipated spring tradition. Everyone left this morning's performance with a smile in their heart and a spring in their step. The boys were impressive. It was a proud day for Saint David's!